ZEBULON, N.C. - The Carolina Mudcats are ready to help fans ring in the holiday season with two new holiday themed ticket packages. The new packages are available by contacting the team front office and include tickets, coupons to the team merchandise store and unique merchandise items including a ball cap or toboggan. Both holiday themed ticket packages, the "Snowball Package" and "Toboggan Package," are immediately available for purchase by calling the Mudcats at (919) 269-CATS (2287) and by visiting the team front office at Five County Stadium in Zebulon, NC. The Snowball Package is just $90.00 (valued at $140.00 overall) and features a Mudcats ball cap, ten undated ticket vouchers, two tickets to the 2019 home opener on Thursday, April 11, 2019 at Five County Stadium and a 10% off coupon to the Mudcats' team store. 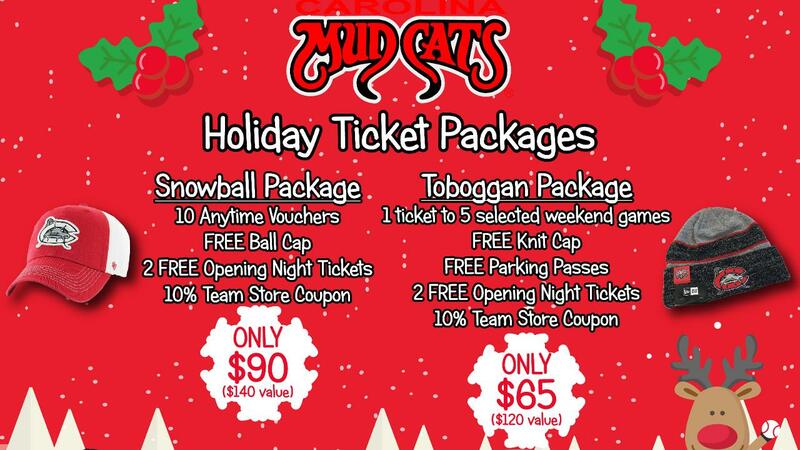 The Toboggan Package is only $65.00 (valued at $120.00) and consists of a Mudcats' toboggan knit cap, a ticket to five selected weekend games, parking passes, two tickets to Opening Night 2019 and a 10% off coupon to the Mudcats' team store. The new holiday ticket packages sale runs from Monday, November 19 through Friday, December 21. Shipping is available for an additional $8.00 for orders placed up until Monday, December 17. The last day to pick up orders at the Mudcats' office or have a package gift certificate sent via e-mail is Friday, December 21. Mudcats' season ticket plans, group ticket packages and mini plans are also all available now by visiting the Five County Stadium front office in Zebulon, by calling (919) 269-CATS (2287) and by visiting www.carolinamudcats.com. Carolina's new season officially begins on Thursday, April 11 with Opening Night 2019 versus the Wilmington Blue Rocks at Five County Stadium. The Carolina Mudcats are the proud Carolina League, Class-A Advanced affiliate of the Milwaukee Brewers. First established in 1991, the two-time Southern League Champion Mudcats are entering their 29th consecutive season of baseball at Five County Stadium in Zebulon, N.C.